If you’re considering a cabin camping vacation but aren’t quite ready for something too rustic or ‘off the grid’, KOA Camping Cabins might be just the option for you! 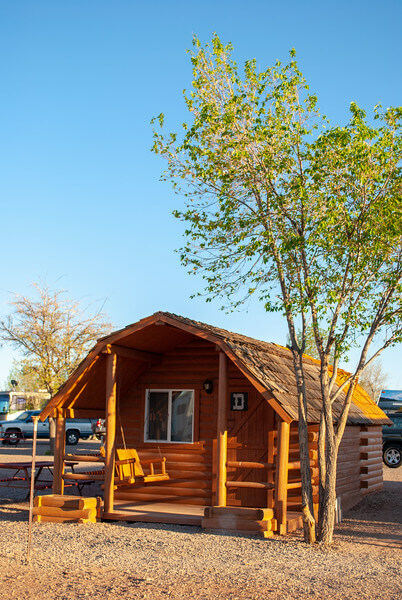 Many think of KOA as a place for RV’ers to set up shop for the summer, but in fact many KOA Campgrounds offer a wide range of cabin camping options, from single room ‘rustic’ cabins to the comforts of home! 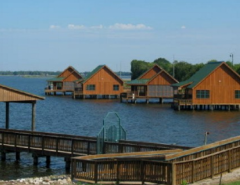 KOA offers several options for cabin camping, and since each campground is privately owned, choices will vary at each location. KOA has a great website which is easy to use and up to date with cabin types and availability. Starting at the most basic are the one or two-room camping cabins. These are usually very affordable, but offer the least amount of amenities. As a tent camper, these are my go-to alternative when weather isn’t conducive to tent camping, or if I’m just feeling lazy about setting up camp. Most of these have a double bed plus twin bunk beds. 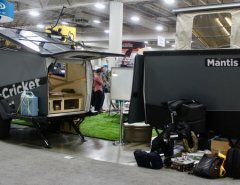 There is no kitchen or bathroom, so it truly is like camping! Sometimes this basic cabin will have a small fridge and/or a television. The next type of cabin will be a Deluxe cabin. These really vary the most from campground to campground. Most will have a bathroom, and you will have anywhere from no kitchen, partial kitchen to a full kitchen. Bed configurations will also vary, from queen beds to bunk beds. 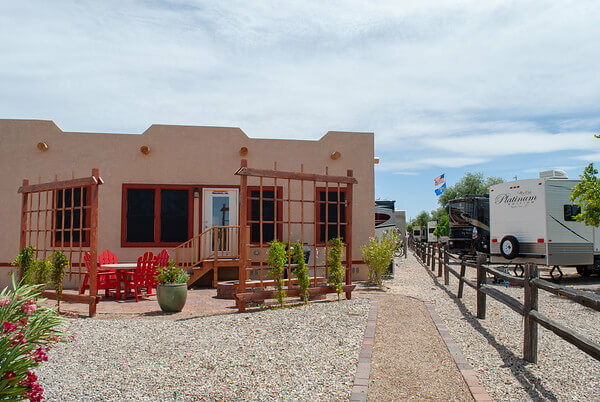 Many KOA campgrounds will add a regional flavor to the cabins, such as the Deluxe Adobe cabins at the Tucson KOA. There are several benefits to staying in a KOA Cabin. Maybe you are thinking about getting into camping, but are nervous about sleeping outdoors? KOA Camping still counts, but I always feel a little safer with a few people around. I mean, a bear would never make it past the KOA general store or swimming pool to get to me, right?! You might be surprised at all of the family friendly activities you’ll find at a KOA campground. Many have swimming pools, mini-golf courses, organized activities, movie nights, and some even have a restaurants and dining options which are a great option if you haven’t invested in camp cooking equipment. For my extended family, the biggest benefit of KOA camping is that it accommodates everyone in the family, regardless of camping style. We have a canoeing and camping family reunion at a KOA campground each year. 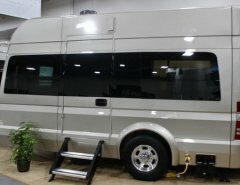 My uncle and aunt have a big RV, my cousin has a pop-up trailer, while I prefer to sleep outdoors in my tent. The rest of the family aren’t really campers, so they get the cabins. After several years of fine tuning this trip, the multiple accommodation types at a KOA are the only option for us. We can all share meals and a campfire and then retire to our own favorite sleeping choice at the end of the day. Like many hotels and airlines, KOA has a rewards program. For a $30 annual membership fee, you save 10% on your KOA stays, plus you earn rewards points. For someone who loves hotel points, it’s nice to know I’m earning points when I stay at a KOA, too! I spent at least ten nights at KOA campgrounds last year, so I easily recouped the membership fee with my 10% discount. Some of the perks of staying in a KOA cabin can also be drawbacks. KOA campgrounds draw lots of families, for the reasons listed above. This can mean lots of kids running around, making noise as kids do. KOA’s are pet-friendly, but not every pet loves camping, so you may have to listen to some barking, and usually once one dog starts, you’ll soon have a symphony. Depending on when you visit, you may encounter large groups of people. I have found that KOA’s have quiet hours that are usually adhered to, but it doesn’t hurt to call ahead to the KOA to see if there are any special events in the area during your visit. Events like the Sturgis motorcycle rally or Indy 500 come to mind. I might avoid KOA’s in those areas knowing that the party crowd is in town! If you travel with a dog like I do, you should know that not all KOA cabins are pet-friendly. Pet policies vary widely by location and cabin type. Most camping cabins will allow pets, but you’ll have to check online to see what additional fees you’ll incur while glamping with your dog. Depending on the camping style you are used to, luxury camping at a KOA can be expensive. The camping cabins can range from $60 to more than $100 per night, depending on the location and season. If you are just looking to save money on a hotel room, then you’ll want to compare prices as sometimes it’s not a huge savings. However, for the benefits listed above, plus the rewards program, cabin camping at KOA is usually a great deal. Many campgrounds also offer extended stay rates, so if you’re staying a while, call ahead to ask! So, what should you pack for this luxury camping trip? Of course, this will vary based on cabin type, but the list below applies to the most basic cabin. You can call your specific KOA ahead of time and subtract anything that is provided where you are staying. Linens – most cabins do not have linens. You can bring sleeping bags, travel sheets, or regular sheets and blankets. Don’t forget the pillows, or it’s not really glamping! Bathroom Supplies – you may be schlepping across the campground to shower, brush your teeth or use the restroom. I find it helps to have a small tote bag to bring along. Don’t forget bath towels and shower shoes! Kitchen Supplies – First, sketch out your menu for the weekend so you know which kitchen supplies to bring. You can choose to prepare only finger foods, or you might want to impress the family with your gourmet cooking skills. A JetBoil stove is great for quickly heating up water for coffee, cocoa and oatmeal. Most campgrounds have a dishwashing station near the restrooms, so you can bring your best picnic-ware and skip the single use plastic utensils and paper plates. Campfire Supplies – this includes chairs, a hammock, wood, roasting sticks for S’mores or hot dogs and maybe even a book of spooky ghost stories. Are you ready to add a KOA Camping Cabin to your summer plans?